Prince George is expected to be christened after his great-grandmother Queen Elizabeth returns from her summer retreat in Scotland. Britain's Prince George is expected to be christened in the UK’s autumn. The newborn royal's parents, the Duke and Duchess of Cambridge, will likely set his christening for September or October, after Queen Elizabeth and Prince Philip return to Buckingham Palace from their annual summer retreat to their Balmoral estate in Scotland. It's thought the official ceremony will be similar to the one the baby prince's father had in 1982, taking place in the Music Room of the palace in front of an intimate gathering of family members. The traditional christening will also see little George adorned in a replica of the 1841 Honiton lace and satin christening gown first worn by Queen Victoria's eldest daughter, also Victoria. The original gown was worn in 30 royal christenings ? including William's ? before it was retired in 2008 by the queen's official dresser, Angela Kelly, because it was deemed to be too fragile. The royal heir ? 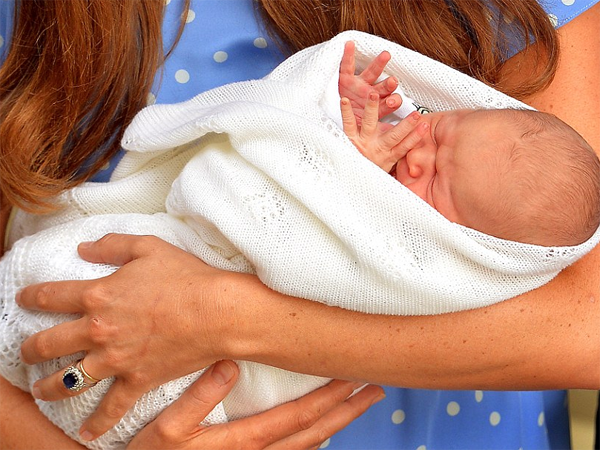 who was born to William and Kate at 4.24 pm (GMT) on Monday ? is currently enjoying some quality time with his parents and maternal grandparents at Carole and Michael Middleton's home in Bucklebury, Berkshire, following a short stay at Kensington Palace. Mother and baby are expected to stay with the Middletons for a few weeks as Kate adjusts to motherhood, while William has taken two weeks of paternity leave from his duties with the Royal Air Force.